"We're headed into another week where I think the inverted yield curve will embolden the bears ... [but] the Fed just took us one rate hike too many and now we're all paying the price," CNBC's Jim Cramer says. Investors should "stay the course," and concerned investors should stick with stocks that have the safest dividend yields "and get ready to ride through these troubled waters," the "Mad Money" host says. "If you can, I think if you can get in on a piece of the [Lyft IPO] action, you should do it. If you're going to buy it in the after market, you have to use a limit or I'll never forgive you," he says. An inverted yield curve is not an automatic signal that a recession is around the corner, and investors should be aware that there are bargains on the market, even if the economy is slowing down, CNBC's Jim Cramer said Friday. Cramer blamed the selling in large part on computer algorithms because yield curve inversions in the past have preceded recessions, most recently in 2007. But he said the machines have no way of differentiating one stock from another. "People act like this automatically signals that we're going into a recession, but it might signal nothing more than the fact that the Fed should never have tightened in December," the "Mad Money" host said. "We're headed into another week where I think the inverted yield curve will embolden the bears ... [but] the Fed just took us one rate hike too many and now we're all paying the price." Cramer suggested that investors "stay the course," and concerned investors should stick with stocks that have the safest dividend yields "and get ready to ride through these troubled waters." 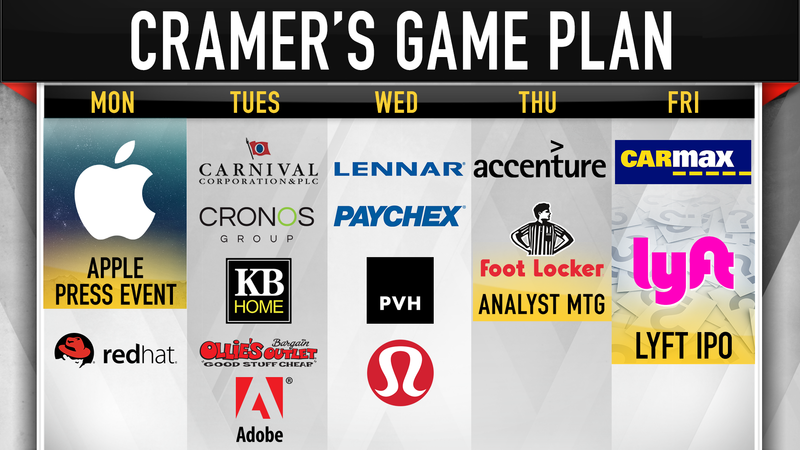 Apple: The iPhone maker will reveal new products on Monday and Cramer said it's time for the tech giant to beef up its services. And he warned, given the stock's run as of late, that the Apple bears are itching for an announcement that's a let down. "I want them to buy Dexcom and Tandem Diabetes so they can offer diabetics a blood sugar monitor-slash-insulin pump that can be controlled from you cell phone," he said. "I like this idea better than one more video channel, but if Apple's working on a multi-media bundle I could see why that's intriguing." "All I want to hear from them is how the business is doing across all clouds, not just IBM's since the merger was announced," he said. Carnival Cruise Line: The cruise company delivers its latest earnings before the bell. Cramer said it will be tough for Carnival to top Norwegian Cruise Lines, but he suggested it's a buy highlighting the 3.54 percent yield. "I would pick some up with the understanding that things can't be that bad for Carnival if Norwegian's doing that well," he said. "I love this cannabis theme. Larry Merlo from CVS is introducing cannabidiol-based products, that's CBD, and I wonder whether some of it will eventually come from Cronos," he said. "That said, I still favor Canopy." KB Home: The homebuilder has an earnings call scheduled after the bell. The company gives a good look into California's real estate market, Cramer said. Ollie's Bargain Outlet: Shareholders will hear from the retail chain after trading ends Tuesday. "It's cheap. It's down 18 points from its high for no particular reason. It's go some short sellers saying something about it," he said. "I bet we'll start hearing a lot of good things to make you want to buy the stock regardless of the inverted yield curve," Cramer said. "If I'm right, the pin action could very quickly spread to the other cloud names." "I think that the last few months have untethered the housing market from anything except mortgage rates and right now mortgage rates are plummeting, so it might be a better time to buy yourself a home or stock," Cramer said. "Their last quarter was a fine one. I think this one will be, too," he said. PVH: PVH holds a collection of recognizable brands such as Van Heusen, Tommy Hilfiger, and Calvin Klein, among others. The company's earnings report comes after the market close. It's a stock with a good story, but there are detractors waiting for it to trip, Cramer said. "I think Lululemon has the best momentum in the [apparel] group," he said. "This information technology consulting company is terrific at helping clients trying [to] go digital. But, you know what, when it reports it tends to get hit. And then when it gets hit, you do some buying." "I thought Nike was simply under promising and certainly will over deliver," he said. "Apparently China has discovered jogging, which is the sweet spot for the company ... If Foot Locker tells a good story, Nike's stock can run. I would buy Nike ahead of the meeting." Carmax: Carmax's earnings report will give more insight into a weak auto industry, the host said. The used-car dealer will reveal results before the open and could disappoint again, he added. "I wish I could be more positive about this giant auto retailer that's run so well, but the numbers probably won't add up," Carmer said. Lyft: Lyft will officially list under LYFT on the Nasdaq to close out the week, and Cramer said it will be "absurdly oversubscribed." "If you can, I think if you can get in on a piece of the action, you should do it. If you're going to buy it in the after market, you have to use a limit or I'll never forgive you," he said.